An announcement today by Ford and Domino’s could mean bad news for delivery drivers. 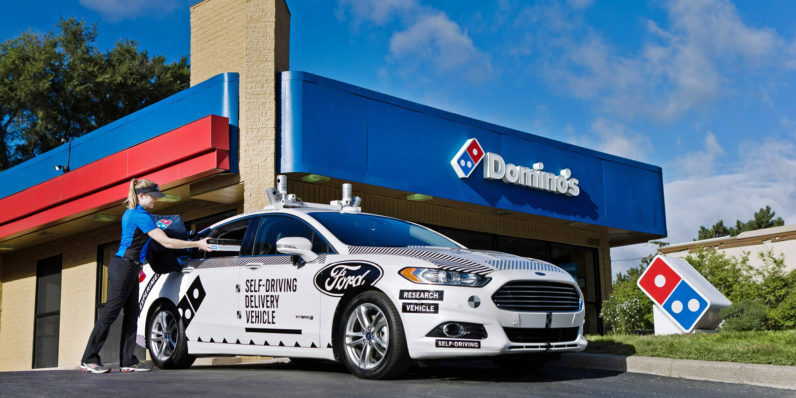 According to a joint press release, the companies are combining forces to deliver fresh-from-the-oven pizza using Ford’s self-driving Fusion test vehicles. For customers that opt in (currently limited to those in Ann Arbor, Michigan), they’ll be able to track their order from payment to the front door using GPS and a modified version of Domino’s Tracker. Customers then receive a text when the car is outside their door, along with a unique code to unlock the Domino’s Heatwave Compartment. Inside the compartment, they’ll find a pizza — hopefully. The initial focus of our research together is understanding the last 50 feet of the delivery experience. What that means is we will be looking at how customers respond to this new experience, which will require them to interact with the self-driving car instead of a delivery person — walking out to the vehicle instead of just walking to answer their front door. The collaboration, while exciting, isn’t a fully autonomous one. Ford safety engineers and researchers will ride along, although they aren’t expected to take part in the delivery itself, according to our sources at Domino’s. It’s not drone delivery, but the experiment still provides an opportunity for Ford’s engineers to log autonomous miles in a real-world environment that’s both useful and, um, delicious.